Sophie disappeared. Not unusual for her. But then a couple of days passed. Still, multiple times she has been gone that long before and has always happily shown up with that look of “of course I’ve been gone, why wouldn’t I?” on her face. I only started to worry when her brother started to act weird. He started wanting in and out in a much quicker manner than normal. It dawned on me – he was looking for her. And so I began to search. I called and walked the neighborhood. I know we have coyotes in the area, but she is a smart girl and I tried to not contemplate that option. Not only could I not find her, I couldn’t see any other cat either. The only time I could see Jinks was when he was at the sliding glass door wanting in. As soon as he would go out again he would disappear. Another day passed. I walked the street again and came across my next door neighbor. She is a cat lover with cats of her own and a luscious garden. She knows our cats well. Within ten minutes of telling her that Sophie was missing, she calls over the fence that I should come because she has our cat in her garage. I went around and in her garage side door and she said “Listen!”, and there it was, a very quiet small meow. I called Sophie and up she came to me. That little girl had been scared by some excavating that another neighbor had been doing and had raced into a slightly ajar door and gotten herself locked in the next door neighbors garage. For three and a half days. I carried her home, bruising her ego. I put down fresh water and food and she drank for about five minutes totally ignoring the food. I pet her. Then she wanted out. Well, I didn’t want to let her out, but our cats are outside cats and it just seemed mean to keep her in. I opened the door hoping that she had learned her lesson – speak up or be stuck (I’ve mentioned, haven’t I, that neither Sophie nor Jinks meow much at all). The day was warm and sunny. I went about my business wondering when she would show up again. 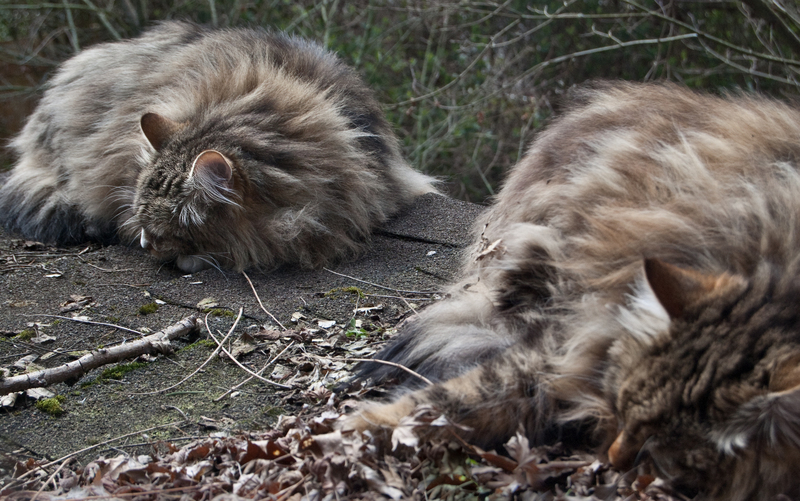 The next thing I see out back is Sophie sleeping in the sun on the shed roof off our back deck with Jinks right beside her. She stayed there and slept for eight hours. Jinks stayed by her the whole time. 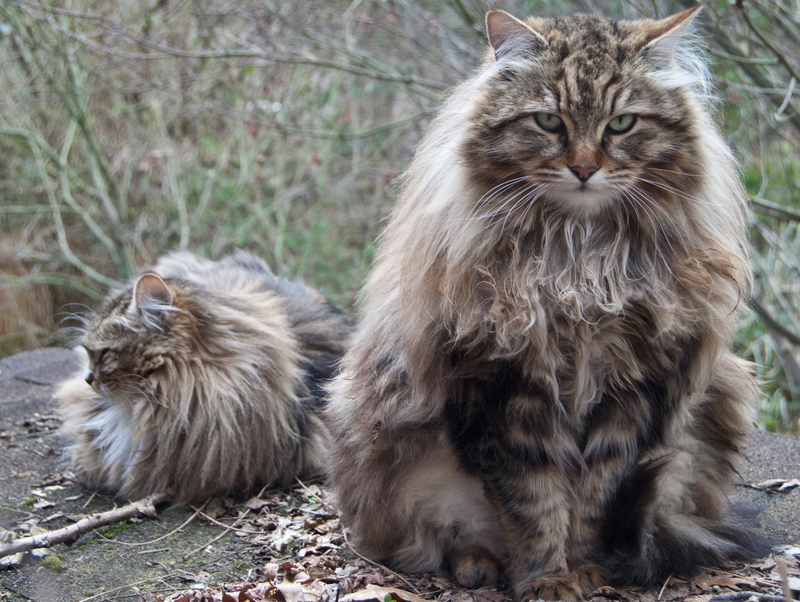 She just slept, he slept and stood guard.